Contribute to professional networks and associations and build productive links with the wider community to improve teaching and learning. Take a leadership role in professional and community networks and support the involvement of colleagues in external learning opportunities. 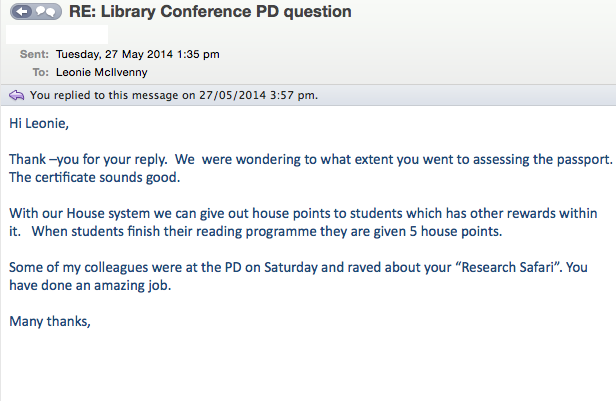 In both previous and current roles I have taken an active leadership role within the school library community. 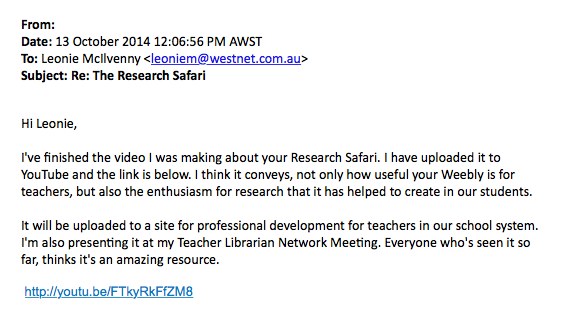 As a library support officer, curriculum consultant and library consultant previously I was responsible for developing professional learning opportunities for school library staff. 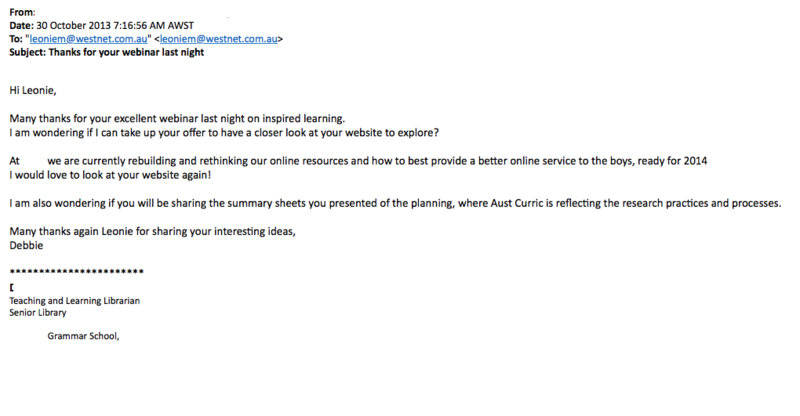 As a professional learning provider through Studyvibe. 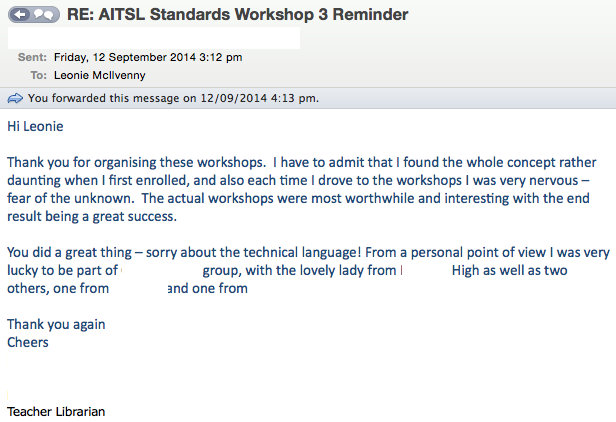 As a presenter at a series on local. national and international conferences. The following annotated examples provide comprehensive evidence in my contribution to the school library community if a professional capacity. 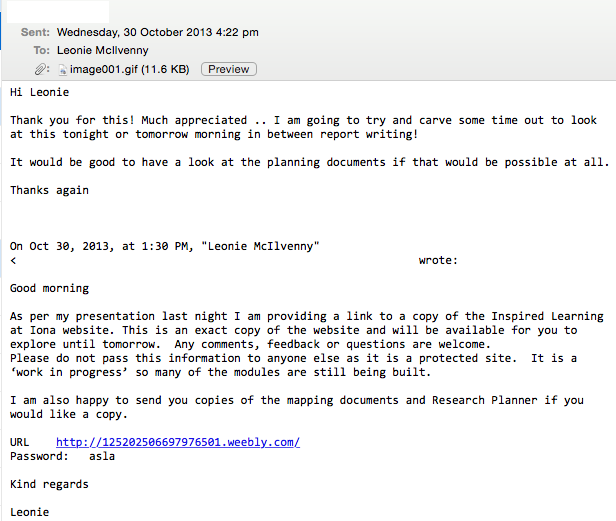 The following are examples of where I have contributed to professional networks through conference presentations. McIlvenny, L. (2013, 11 May). 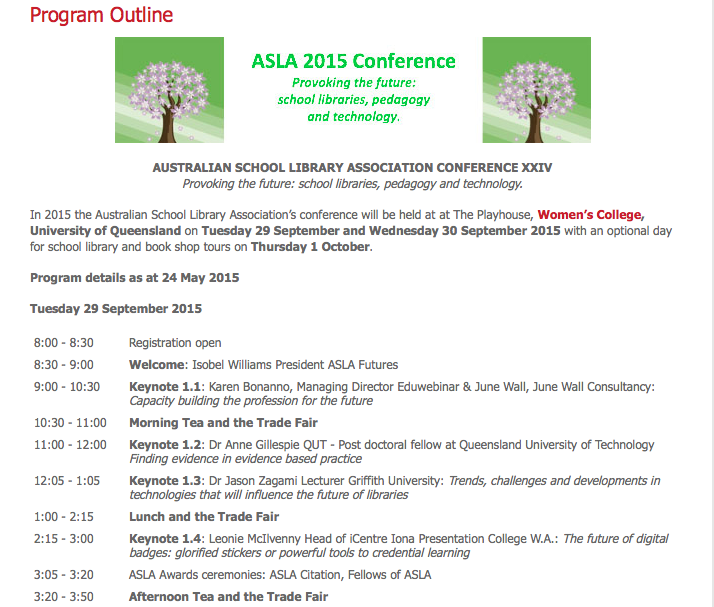 English, library and technology - a synergistic approach to developing literacy. 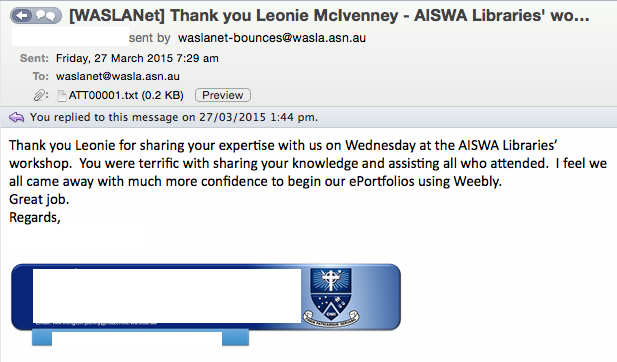 Paper presented at the ALEA State Conference, Esplanade Hotel, Fremantle. Sheffield, R., & McIlvenny, L. (2014, 30th - 31st January). 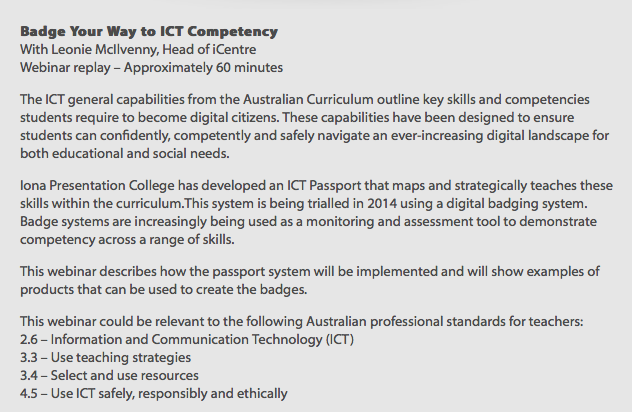 Exploring the Boundaries of Science Inquiry, Sustainability and ICT. 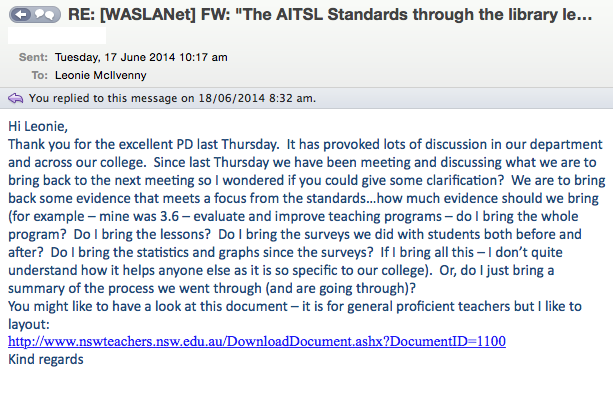 Paper presented at the Teaching and Learning Forum, University of Western Australia. Sheffield, R. & McIlvenny, L. (2013). Why do Whales Beach themselves? Science Inquiry using Technology. Paper presented at the ICASE 2013 World Conference on Science and Technology Education. Kuching. Borneo. Sheffield, R. & McIlvenny, L. (2015, 4 July) Why Do Sharks Attack? 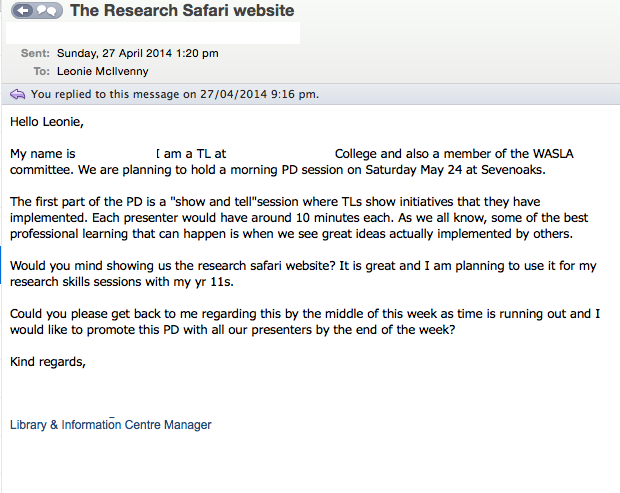 Using Web 2.0 Tools to Facilitate on-Line Science Inquiry from Primary to Tertiary Classroom. 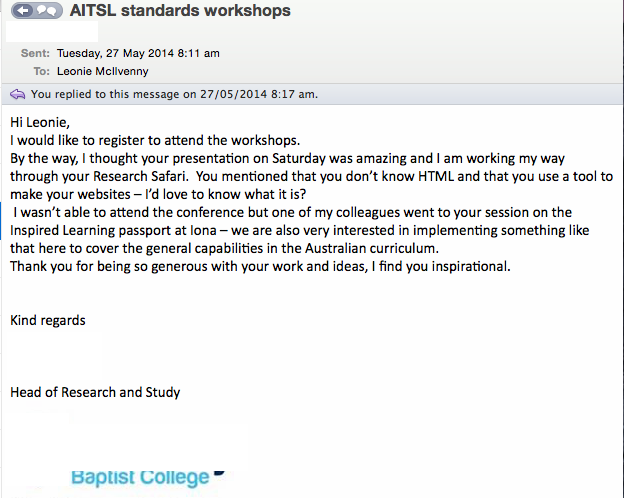 Paper presented at the European Conference of Technology in Education,. Brighton, England. 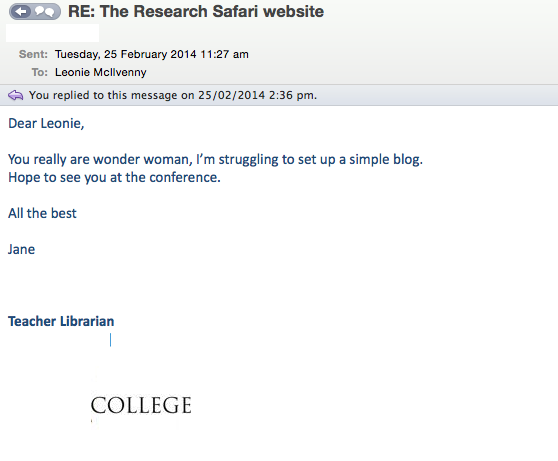 Examples of correspondence that shows my involvement on professional activities. 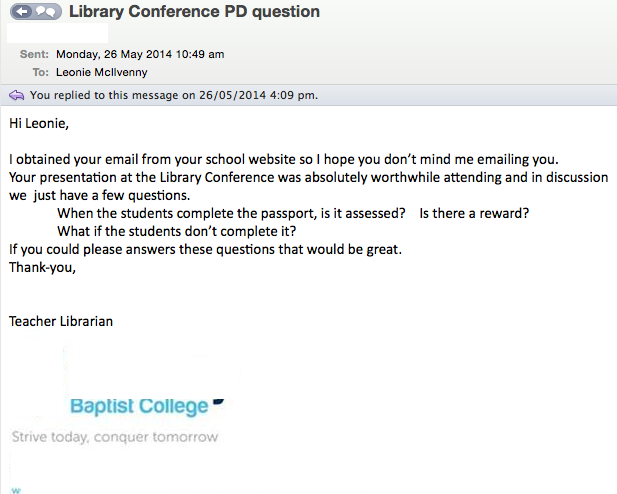 The following are examples of letters of appreciation for my contribution to the school library community. 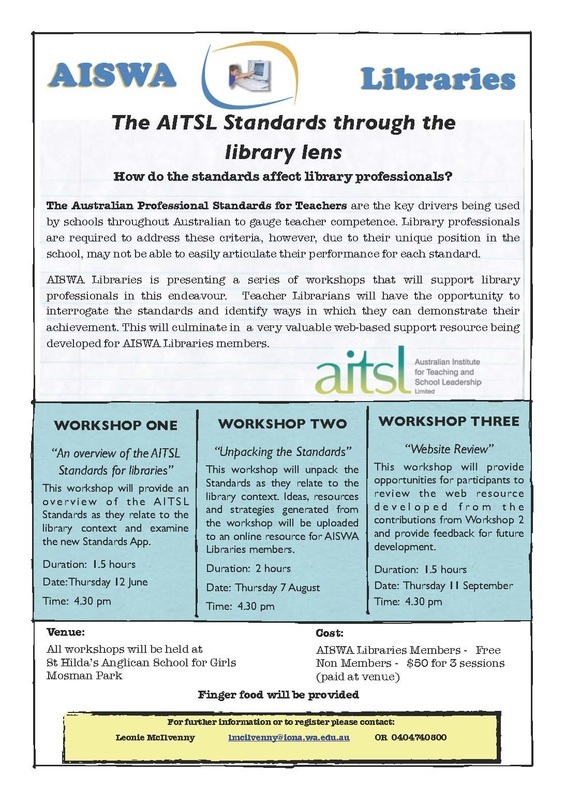 "AITSL through the Library Lens" was a three workshop series designed to help teacher librarians address the AITSL Standards. 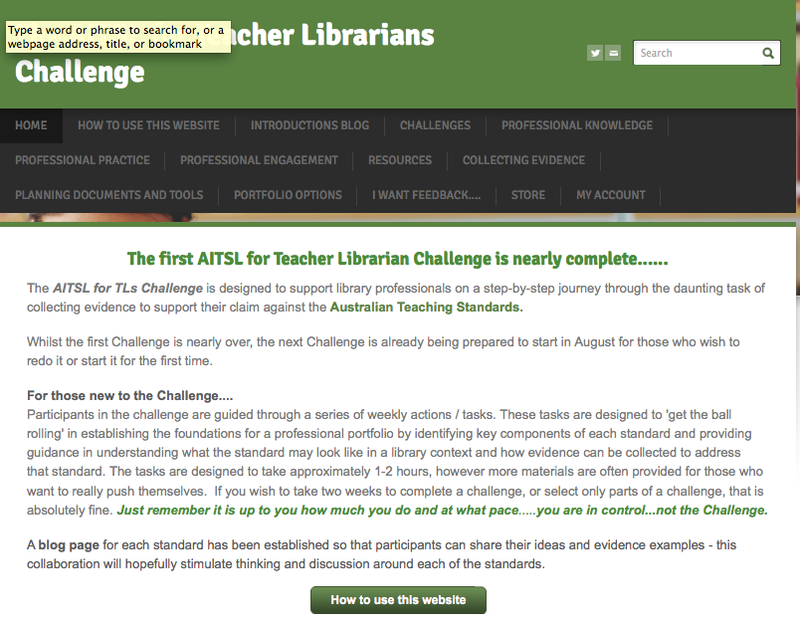 It resulted in a website that provides support materials. 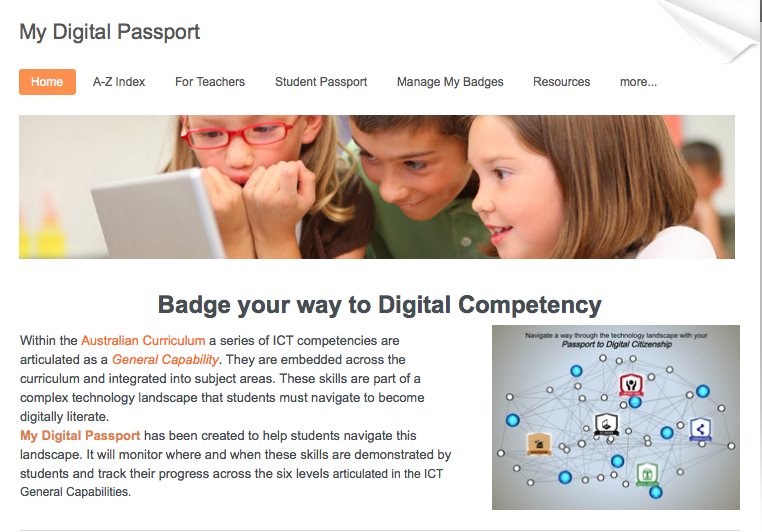 The My Digital Passport website provides a range of support materials for teachers that were made arable to them after a series of webinars and workshops. 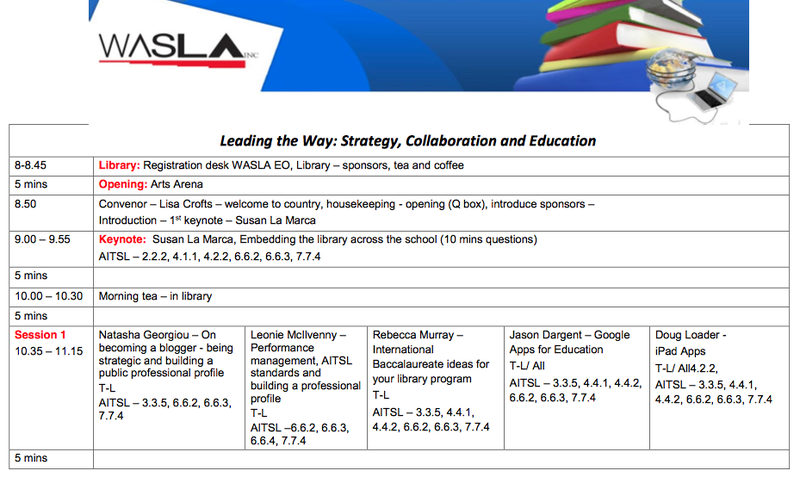 The flyer for the 3 workshop professional learning that I ran for AISWA Libraries. 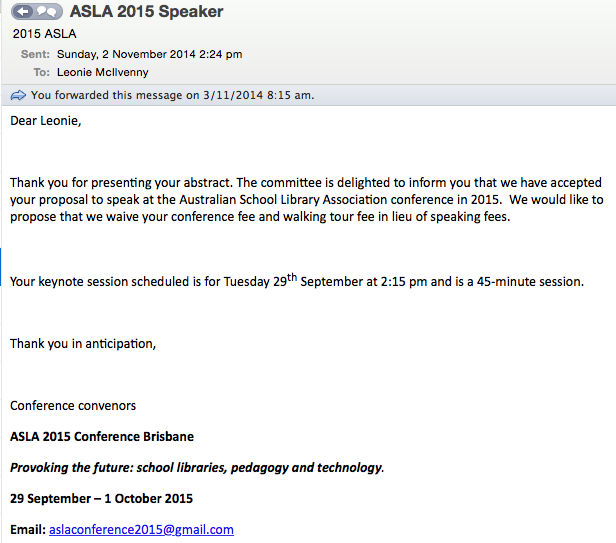 This screen capture shows my keynote presentation description for the Australian Library Association Conference in September 2015. 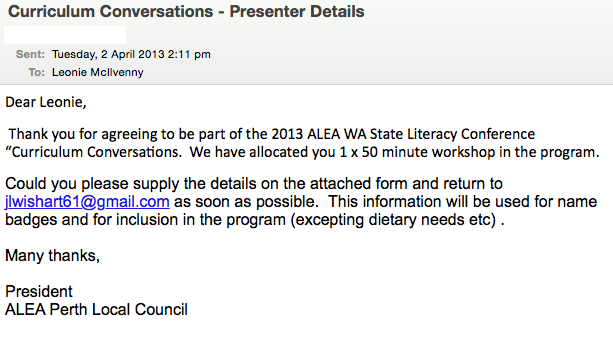 This screen capture shows details of a presentation I will be presenting at the WA School Library Association Conference in August 2015.